Tired of Suppliers Redlining Contracts? Tired of Endless Waiting for the Legal Department to Review Your Contracts? The contract will be the reason why you are successful instead of the reason why you get bogged down. You know the feeling well. It’s that pit in your stomach that you get when a supplier redlines your contract. You know the contract now has to go to the legal department for approval, which is where contracts go to die. That blasted legal department, why are they so slow and understaffed? That’s when things slow to a halt, and the lawyers go at it – but only when they are good and ready. There are a pile of contracts ahead of you in line, and the legal department does not share your urgency for getting things closed. Why did the supplier have to redline your contract? Why is the legal department so understaffed? Your customer is in a rush, you raced to get the contract done, and now it’s come back marked up in red ink from the supplier. What is going to happen to your negotiation timelines, and how are you going to explain this to the customer in a way that he or she will recognize that this big delay coming up is not your fault? How can we streamline or avoid this time sucking process? The first thing you need to do is completely change your entire perspective about contracts. All the heartache and headache that comes with negotiating contracts is preventable. First is to stop thinking the legal department owns the contract and that a contract approved by legal is a good contract. Nothing could be further from the truth! Legal is looking for completely different things than you are, and a legal department approved contract can still be a terrible deal for the business that causes you endless frustration. Second is to stop contracting for goods and services, and to start contracting for performance results. Don’t forget, your customer asks for goods and services, but they will always complain about the performance results. Third is to use powerful insider secrets to prevent suppliers from having the opportunity or desire to redline the contract. Fourth is to use a special trick of the purchasing masters to SLASH contract negotiation total cycle time by 75% or more. Think of what you could do with all that free time. Fifth is to stop thinking the standard contract template – which is just a piece of paper that has no idea whether you’re buying office supplies or nuclear weapons – offers enough protection for your situation specific purchase. The contract is a pay now or pay later process. If you just slap a SOW or Spec to a standard contract template, you WILL pay later. Don’t fall victim to this. By the way, don’t think you need to know “legalese” to write or modify a contract. This myth is holding our profession down like a lead weight! Sixth is to STOP viewing the contract as a seatbelt in the event of emergency and to START viewing and using it as a powerful tool to enable supplier performance and PREVENT supplier excursions. There are powerful documented processes and methodical steps, developed through painstaking research and efforts, that must be taken in order to properly achieve the above. Once that is accomplished, contracts will shift from being a thorn in your side – something you HAVE to do – to actually being a great aid to achieving world class results in much shorter negotiation time frames. In short, contracts will become something you WANT to do, because they make your life so much easier, and because they will be a difference in maker in your job, career, and income path in our profession. It’s one of the most liberating experiences you can ever have in our profession as a purchasing professional. You won’t need to rely on the legal department any longer! Pretty soon you will be a high performing internal consultant to your peers, and that gets attention and spells promotion. I know, because I went through that exact cycle, many times. I became a hero in my Fortune 50 company (Intel Corporation) for my contract law knowledge and capabilities. Follow my lead on these areas and you’ll see exactly what I mean. The results are a blast, and your career will get a big boost. By the way, I want you to know that everything that is taught in this online course is 100% applicable to every commodity, every industry, every global region, and every set of laws. Don’t think for a minute that this breakthrough training series won’t apply to you. While others teach is the definitions of contract clauses and how to use the contract as a safety belt in the event of emergency, I teach the the value and meaning of each clause + definitions + how to negotiate and customize these agreements to prevent excursions, produce better supplier performance and TCO results, and reduce risk. This reduces reliance on the legal department and managing the contract negotiation process in much more expedited fashion. I will help you conquer your fear of contracts and contract law (a very real fear) and help you to stop using the overwhelmed legal dept as a crutch to manage the process. The legal department isn’t looking out for your best interests anyway; they are trained to look for totally different things than you are. I also show you how you can customize a contract to your specific needs and requirements, so that you can prevent excursions instead of respond to them, and when excursions do happen, you can have the remedies already pre-defined in the contract. All of this slashes your overall time spent on contracts and excursions and gets you far better results. This means less stress and your career gets on the fast track. I’m pleased to announce my advanced training on the topic of Eliminating Supplier Redlining & Purchasing Contract Law Strategies. The result of months of blood, sweat, tears and sleepless nights that is now changing our profession. It’s all easy for me now and will be for you too, but when I think back about it, it was an enormous undertaking and bucking of the system to make happen. It’s going to be easy for your because you’re going to get access to the recordings of a recent intimate live seminar event that I held. You’re going to learn the secrets in this course from the comfort of your home or office and any hour of the day that suits you. A total of six videos broken up into about 45 minutes of training for a total of almost five hours of very easy to digest and immediately implementable starting the next day you go to work. Watch the videos over the weekend and start Monday off by implementing my empowering, career changing secrets. Imagine what it’ll be like to literally eliminate supplier redlining. Imagine not waiting for the legal department for contract approvals, or needing them at all. How much burden and stress will that relieve from your day to day business? Yeah, it’s a total game changer. Because I had 18 years experience with Intel Corp, where I rose to the position of leading their entire global corporate purchasing operations organization. My experience and strength in negotiations earned me the corporate designation of “Thee Godfather of Negotiation Planning” for the entire $2.2B global purchasing organization. It’s why I’m known as the most trusted, sought after Purchasing trainer in the world and am famous for creating paradigm shifts in the way Purchasing is done without resorting to the old, status quo that doesn’t work today and never really did. Since 1995, I’ve taught thousands of hours of courses, workshops, and seminars in 15 different countries on topics related to the entire spectrum of purchasing, supply chain management, purchasing contract law, negotiations, and supplier management. Attendees paid THOUSANDS just to hear this content once. You get unlimited access with our special members only offer. Now before you get this, let me tell you exactly what you’re going to discover so that you know it’s right for you. How your behavior – or your customers behavior – can and will create or modify a contract – and how to avoid it! Which clauses MUST be customized to your requirements, or you might have no protection at all! Which clauses you want to remove from your contracts – silence can be a good thing! Which state’s laws you never want your goods contract governed by, or you will pay the price! How a seasoned Fortune 50 purchasing director signed a supplier contract that turned into a massive lawsuit and ruined his career; we will review & fix that contract so you never make the same mistakes! What secret clause you can add that will GUARANTEE you are getting the lowest price of any of your supplier’s customers, even if they are spending much more than you are! Finally, how to use your newfound mastery of the Power Secrets of Purchasing Contract Law to catapult your confidence, your capabilities, your results, and ultimately, your career and your income! And one of the biggest secret of all! You’re going to learn the mother of all secrets, which is how to extract savings from the money you already overspent the contract by! That’s a LOT of awesome training that you’re going to get your hands on. The training consists of six videos that average approximately 45 minutes each. About five hours of training that you’ll be able to put into action and make a paradigm shift in the way you deal with suppliers and contracts immediately. You’re also going get the Student Handbook that the live attendees received, the course slides in PDF format and a copy of the contract Case Study. You know, you’re obviously really serious about getting these results and I just want to take some time to acknowledge you for that. Most people never take the time to properly educate themselves the way you are. You’re online, your reading this and you really have the commitment and determination to do this now. That’s why you’re perfect for Power Purchasing Pro. It’s specifically designed for you. So what’s your investment to produce a paradigm shift that will free your from the chains of contracts? What’s it worth to you to once and for all have the ultimate control of suppliers and contracts and eliminate this stress from your life? Knowing what I know, I’d write a check for $5,000 in a heartbeat. Even more in fact, seeing how it catapulted my career and exploded my bank account. Don’t worry, I’m not going to ask you for $5,000. My fee for one hour of consulting is $450. So with five hours of this caliber of career changing training, $2,000 would be a fair price. But I’m not going to ask for $2,000 or even $1,000 or even $500, although it’d be well worth your investment. We wanted to make this a no-brainer investment for you and something you can easily afford. When you take action right now, I’ll let you take a risk-free, test-drive of the Membership course for only $297. You Risk NOTHING to Discover These Career Changing Contract Strategies and the Liberation That Goes With it! Like all of my training Memberships, I personally back this with my 100% money back guarantee if you are unhappy with this for any reason at all. Take a 30 day test-drive of this training. If for any reason whatsoever you aren’t 1000% satisfied with this Membership, I want you to request a refund of your investment by calling: 1-888-826-4889. We will promptly and happily return every penny, no questions asked. So don’t waste another minute and another day dealing with redlining and contract purgatory. Click the button and get your Membership to this course right now, before the price increase. WARNING: If you continue to deal with redlining and contract purgatory, you’ll continue to deal with the stress, headaches and no control over your livelihood and career. Join Now and experience the liberation. P.S. Remember; you have nothing to lose and everything to gain because you’re protected by my 30 Day, No Questions Asked Refund Guarantee. Eliminate supplier redlining, dealing with the legal department by become an expert at contract law and taking action right now. 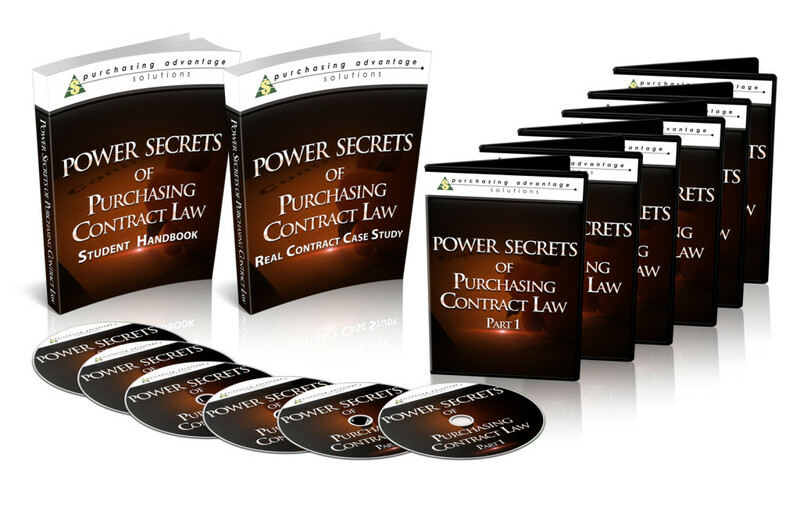 Grab your Power Secrets of Purchasing Contract Law Membership today. You’ll be glad you did!